April 8 2013 We now have 12 members!!! How wonderful to have found all these new and wonderfully kind and intelligent friends..Together we can do anything and quitting smoking just became easier for each of us because we have each other to lean on... to be sad with and to let out frustration....AND to be healthy non-smokers with! Tell me what the biggest change is in your daily routine....Do you actually look for breakfast now where before coffee and a cigarette WAS breakfast. I find that a yogurt, a bagel and banana tastes really good in the morning now...and then I can go out the door without looking for my cigarettes and making sure I have enough breath mints, and did I put that new little mini perfume in this purse or was it in the glove box? Wow did I streamline my life...Keys, sunglasses and a bottle of water and I am "good to go"! My few dollars a day goes a lot further and I find I actually have more money in my wallet instead of counting out the change the day before pay day ...to just "get a pack till I get paid". Wow I don't miss that feeling of frantically going through pockets and drawers looking for enough change to get just one more pack ...in case...What!!!??? A tsunami ...or it starts raining fish and the stores are all closed...or my car won't start and I only have one cigarette left till tomorrow morning...I can't laugh yet at the vision I see now.... that pathetic me was being held hostage by the chemicals in cigarettes and the addiction to nicotine and I remember so well all the years that the last thing I would check at night was to see if HAD to get up early and get to the store before I "needed" a cigarette and didn't have any left in the pack. I am sure there are many of you out there who have put the sneakers back on and made a last minute run before bed to "Get cigarettes for tomorrow"...I can't be the only one. Am I also the only one who said over and over again..."when cigarettes cost ??? I am quitting..I refuse to pay more than ?$2? a pack!!! When I was a little girl and they were 25 cents a pack...My great friends up North say they pay almost $10 a pack...in the south it's a little cheaper...but still way too much to spend on messing up my future, my life, my health...I LOVE knowing that by taking this one step every minute, every hour and every day I am giving myself a chance at life...something I never thought about.... and at 63 years old I pray it's not too late to start really living life without a crutch and excuse. And you know what, I am so thankful that I decided to end that part of my life and that I have each of you to help me get through each day and craving and to celebrate with.........really...how many other times do you celebrate passing another day with people you never even met??? 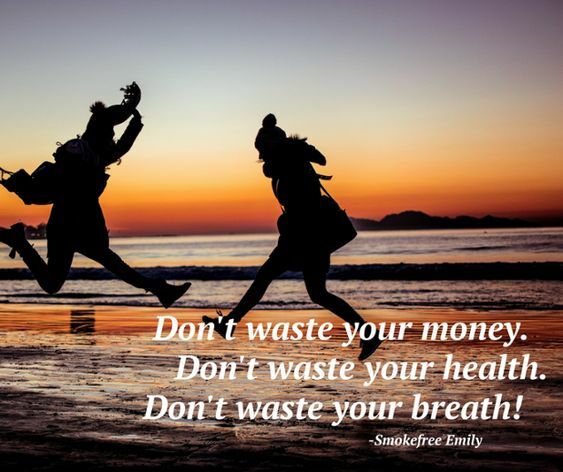 It feels great to be in your company and to know that with each message and blog post we are all pulling together to become free and happy and healthy...we are the best!!! Hi, Barbara. Today was day 3 for me and a work day, the first since I quit. I had fruit with the non-smokers at breaktime and rode my bike on a nature trail for a half hour at lunch, then I ate and relaxed for the other half. I am going to make the bikeride a regular part of my day. I am going through withdrawal, but enjoying every bit of it, even the bad, bad part, because its the last time I'm going thr0ugh it! my biggest change in my routine is after work. I don't waste all that time going out on the porch to smoke. I get lots more done and I walk my dogs longer because I don't rush back to smoke!!! thanks for starting this group! Day 3 for me. Actually spent a good part of the day with a smoker yesterday and didn't smoke! Helps to remind you how bad it actually smells on your clothing.